A revolutionary book of practical advice and inspiration for parenting "differently wired" kids—kids who are challenged by anxiety, ADHD, Asperger’s, giftedness, dyslexia, or other conditions—now in paperback. Filled with strategies and support, it will help every family discover newfound confidence, peace, and acceptance. "In this generous and urgent book, Deborah lets the light in. She helps parents see that they're not alone, and even better, delivers a positive action plan that will change lives." "Raising a 'differently wired' kid can feel like venturing out in unfamiliar territory without a map or a guide. Deborah Reber is the friend you need to navigate this terrain -- not just offering practical tips for parenting kids with autism, ADHD, dyslexia and other conditions, but helping you think about your child's atypical mind in ways that will enable you to help them unlock their unique potential. This is a bracingly honest, beautifully written, and quietly groundbreaking book." “Differently Wired will help parents of children who think differently to accept their child for who they are and facilitate their successful development. 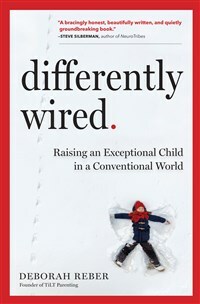 "Differently Wired is a comprehensive and practical approach to parenting a unique and complex population of children. Twice-exceptional children present parents with a plethora of challenges (and joys) which the author addresses with gusto. There are other titles written on this topic, but this in particular, packs significant punch and is a 'must read' for all parents raising children with multiple exceptionalities." "Differently Wired is one mother’s clarion call for moving to action, based on a deep understanding of children who are neurodiverse, and therefore, who think, learn and at times, behave differently. Debbie Reber provides practical advice on a broad range of topics that will be a treasure trove for parents who are desperately seeking guidance in understanding and best supporting their neurodiverse child. This is a wonderfully engaging and much needed book that I will enthusiastically recommend to so many parents and professionals I meet on a regular basis." Deborah Reber is a bestselling author, certified life coach, and speaker who has spent the past fifteen years writing inspiring books for women and teens. However, raising a twice-exceptional son and experiencing the heartaches, headaches, confusion, and unexpected gifts that is typical for parents raising these exceptional kids sparked a transformation in Debbie’s passion and led to a conscious shift from the realm of teen advocacy to the world of supporting the millions of parents who are raising unique kids. She launched TiLT Parenting - a website, podcast, and social media community - in April 2016, where she is building a community of supportive parents of neurodiverse children.